I wish I could remember where I found this image and who did it...but I can't. 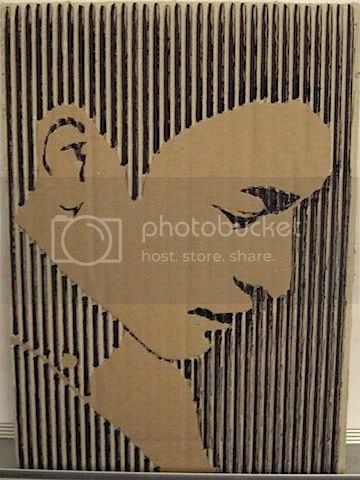 Not only is it a nice piece of art but it is dear to my heart since it is made from discarded cardboard. I USED TO DO THIS IN HIGH SCHOOL. I BELIEVE I JUST CUT THE SIZE OF CARD BOARD I NEEDED AND DREW MY DESIGN ON. THEN TAKING AN EXACTO KNIFE, I CAREFULLY CUT ALONG THE LINES I WANTED GONE. MAKE SURE NOT TO CUT ALL THE WAY THROUGH. JUST PEEL BACK THE TOP LAYER OF WHERE YOU DON'T WANT THE IMAGE OR SHADED PART (THE HEAD IN YOUR PIC, FOR EXAMPLE) IT'S PRETTY EASY. I know that Chris Fennell does this type of art.